At fourteen, I was that student determined to read every single book on the pre-college reading list that my freshman year English teacher handed out. I didn’t care that there were well over a hundred “classics” listed, and that you only had to read two for her class. I was determined to be well read by the time I graduated high school, through sheer determination if need be. Luckily, I started with Jane Eyre (which I loved to pieces). With a good experience at the start, I forged on. Not every book hit the right notes, but between the failures *cough*Lady Chatterley’s Lover*cough* I scoured my local library for books about magic and dragons. And so I discovered McCaffrey’s Pern and Wrede’s Enchanted Forest at the same time as Austen and Hardy and the Brontë sisters, and I loved both kinds of books with different but equal passion. 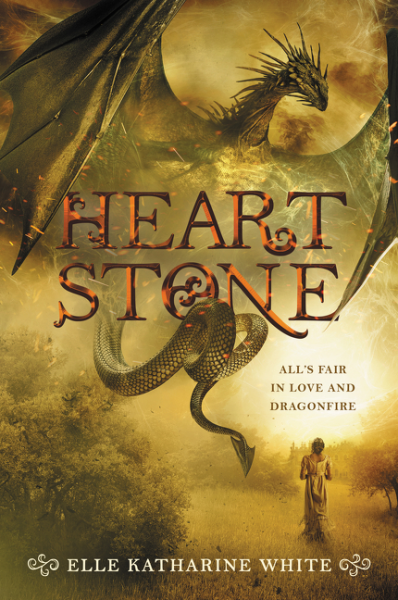 Elle Katharine White’s Heartstone is a mashup for every reader who grew up loving both dragon books and Jane Austen. Her relief is short-lived. With the arrival of the haughty and handsome dragonrider, Alastair Daired, Aliza expects a battle; what she doesn’t expect is a romantic clash of wills, pitting words and wit against the pride of an ancient house. Nor does she anticipate the mystery that follows them from Merybourne Manor, its roots running deep as the foundations of the kingdom itself, where something old and dreadful slumbers…something far more sinister than gryphons. I went into this book thinking it would have some vague Pride and Prejudice vibes, like Jo Walton’s dragonish comedy of manners, Tooth and Claw – but I was wrong. This is a straight up mythological creature retelling, with almost-identical plotlines, similar names (Aliza Bentaine instead of Elizabeth Bennett, anyone? ), and even some of the same exact language in the epistolary sections. If you’ve read P&P, there will be few-to-no surprises. And that’s okay! But be aware - it’s basically a fanfiction AU with dragons (and gnomes, and gryphons, and so on). So, how was it? So-so quality-wise, and yet enjoyable. Heartstone is dialogue-heavy (to the point that sometimes you’re not quite sure who is speaking). It is also written from a first-person perspective (rather than the omniscient narrative of the original), without much set-up or description. It doesn’t feel like epic fantasy, which is usually heavy on worldbuilding. I’m sure this is due in part to the fact that most readers will already be familiar with the source material, and not need introduction to the characters, their situation in life, or their relationships to one other. There’s also the juxtaposition in this case of titles, manor houses, and a class hierarchy, and informal language. It’s a bit jarring at the start, and something along the lines of Pride and Prejudice and Zombies (if you read that). I didn’t like: the baby talk and dialect of the hobgoblins (when no one else seemed to have appreciable accents, even when noted in the text), that there was no resolution to the *spoiler* Elsian Minister’s plot *end spoiler*, and the necessary narrowing of perspective and characterization that a first-person tale necessitates. In a case like this, where most of the work of plotting and characterization is either already set or expected, it is up to the author to surprise the reader, and if possible, to improve upon the source work. Heartstone didn’t accomplish either task, but it was an agreeable read, and I don’t regret spending my time with it. I think it will appeal greatly to anyone who, like me, loves both dragons and Austen. Recommended for: devoted fans of both Jane Austen and dragons. So kind of like Pride & Prejudice & Zombies? Ryan: Exactly. That was the nearest equivalent I could think of! it’s been four months. how do i like my kindle?